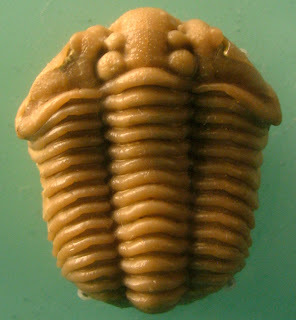 A Calymene clavicula trilobite of the Silurian Period found in Indiana, USA. This picture was taken at Smithsonian Museum of Natural History in August 2010. Part of an amazing collection of trilobites is being displayed in the Hall of Ocean Life in the Museum of Natural History as described at the Smithsonian web site. Dr. Robert Hazen, earth science professor at George Mason University is donating his approximately 2000 trilobite fossils to the Smithsonian. The collection consists about 1000 different species found in Morocco, Russia, Bohemia, United Kingdom and North America. See Dr. Robert Hazen's web page and compare the Calymene clavicula specimen from Oklahoma to the one pictured here. Also pictured on his page is an intact Ordovician Acidaspis trilobite from Kentucky. In addition, two Mississippian Period trilobites (Pudoproetus sp. & Griffithides bufo) found in Montgomery County, Indiana can be seen.